Previous versions of Energy3D were based on a generic model of solar panel, which users can set its properties such as solar cell type, peak efficiency, panel dimension, color, nominal operating cell temperature, temperature coefficient of power, and so on. 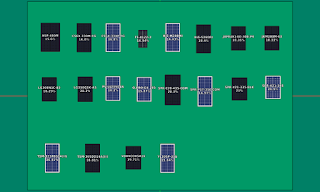 While it is essential for users to be able to adjust these parameters and learn what they represent and how they affect the output, it is sometimes inconvenient for a designer to manually set the properties of a solar panel to those of a brand name. From Version 7.4.4, I started to add support of brand name solar panels to Energy3D. Twenty brand names were initially added to this version (Figure 1). These models are: ASP-400M (Advanced Solar Photonics), CS6X-330M-FG (Canadian Solar), CS6X-330P-FG (Canadian Solar), FS-4122-3 (First Solar), HiS-M280MI (Hyundai), HiS-S360RI (Hyundai), JAM6(K)-60-300/PR (JA Solar), JKM300M-60 (Jinko), LG300N1C-B3 (LG), LG350Q1K-A5 (LG), PV-UJ235GA6 (Mitsubishi), Q.PRO-G4 265 (Q-cells), SPR-E20-435-COM (SunPower), SPR-P17-350-COM (SunPower), SPR-X21-335-BLK (SunPower), SPR-X21-345 (SunPower), TSM-325PEG14(II) (Trina Solar), TSM-365DD14A(II) (Trina Solar), VBHN330SA16 (Panasonic), and YL305P-35b (Yingli). 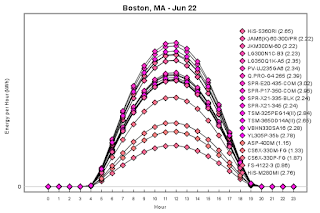 Figure 2 shows a comparison of their daily outputs in Boston on June 22 when they are laid flat (i.e., with zero tilt angle). 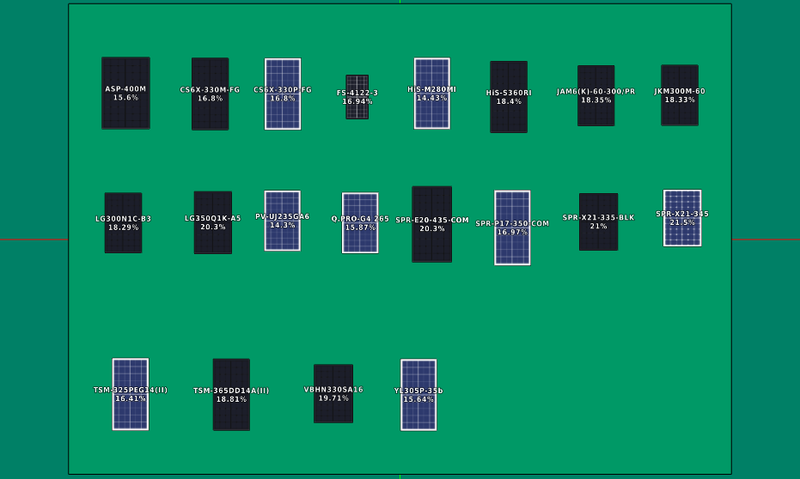 Not surprisingly, a smaller solar panel with a lower cell efficiency produces less electricity. Note that these models are relatively new. There are hundreds of older and other types of solar panels that will take a long time to add. If your type is not currently supported, you can always fall back to defining it using the "Custom" option, which is the default model for a solar panel. 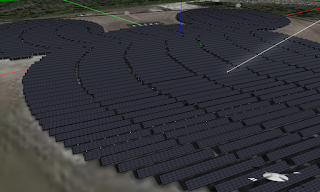 Adding these brand names helped me figure out that the solar panels deployed in the Micky Mouse Solar Farm in Orlando (Figure 3) are probably from First Solar -- only they make solar panels of such a relatively small size (1200 mm × 600 mm).